We've been hearing stuff about Xiaomi's sub-brand Pocophone for some time now, but only this week we got something that's really worth noting. The upcoming smartphone called F1 will boast Snapdragon 845 and it's touted to be the cheapest SD845-powered smartphone on the market. It's expected to hit Eastern Europe and then become available in India under a different name. More importantly, though, the chipset won't be the only key selling point of the device, at least according to the Bluetooth certification document. In it, we find plenty of details about the specs and features of the F1 with the most surprising one being the liquid-cooled chip. In addition, the handset will boast at least 6GB of RAM and 64GB of internal storage going up to 8GB of RAM and 128GB of flash memory. On the back, the F1 will carry а 12MP camera paired with a secondary 5MP sensor for depth sensing while the former will feature 1.4μm pixels. The 20MP front camera, however, is perhaps a bit more impressive. 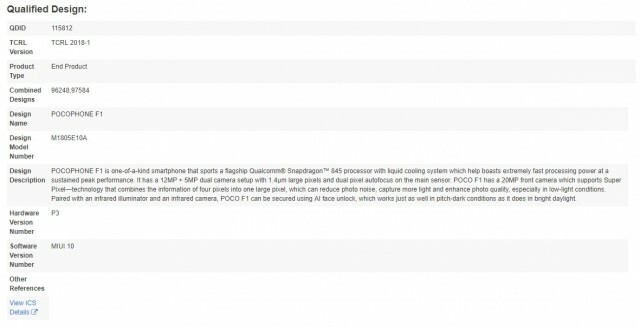 According to the description text in the document, the sensor will support the so-called Super Pixel technology, which is just a fancy word for pixel binning. An infrared illuminator and an infrared camera will sit on the side of the front-facing lens for an advanced AI-aided face unlock. Probably something similar to Xiaomi's current Mi 8 and Mi 8 Explorer Edition. Other less interesting facts about the device include the model number (M1805E10A) and the software version - MIUI 10 out of the box. "AI face unlock" Oh man, the obsession to put the word AI on everything is getting absurd! !